The acting head of the nation's environmental agency said Democrats' proposal to combat climate change was "not ready for primetime," in an exclusive interview with ABC News Live on Wednesday. Acting Environmental Protection Agency chief Andrew Wheeler said he was concerned the resolution dubbed a "Green New Deal" didn't address whether a zero-carbon energy grid would be reliable in the wake of natural disasters or other emergencies. "I've read the resolution that they put out, I've also read the fact sheet that they later disavowed, I'd say probably the roll out was not really ready for prime time," he told ABC News. "But, I am concerned that they really don't seem to value a stable electricity source, grid reliability and for human health and the environment here at the agency, I have to be very concerned about that because it's the electricity system that supplies our drinking water system that runs it." The proposal has been championed by freshman congresswoman Alexandria Ocasio-Cortez, D-New York, and Sen. Ed Markey, D-Massachusetts, who say it provides a framework on how the country can drastically reduce carbon dioxide emissions and rework the entire economy to combat climate change. Republicans have blasted the proposal, calling it overly broad and comparing it to socialism. Senate Majority Leader Mitch McConnell recently announced it would go to the floor for a vote, though the resolution is not legally binding. 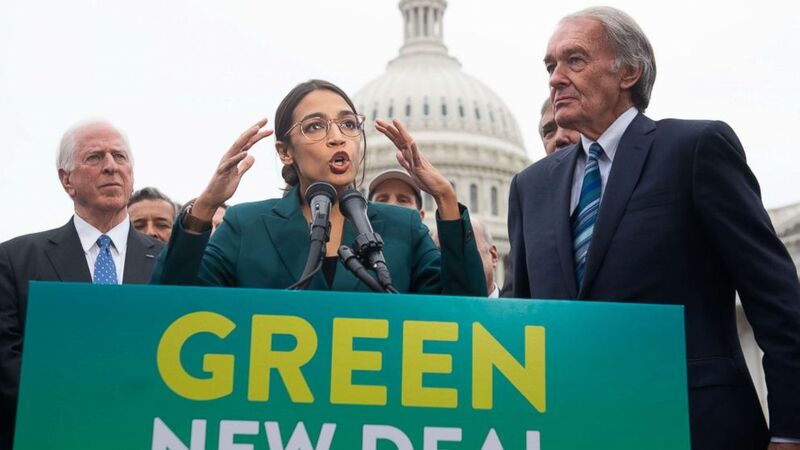 (Saul Loeb/AFP/Getty Images) Rep. Alexandria Ocasio-Cortez Sen. Ed Markey speak during a press conference to announce Green New Deal legislation to promote clean energy programs outside the U.S. Capitol in Washington, Feb. 7, 2019. On the broader issue of climate change Wheeler told ABC News that he's studied the evidence from leading U.S. climate scientists and calls global climate change a problem -- not a hoax -- but one that hasn't yet reached "crisis" stage. He was also asked in hisrecent confirmation hearing about climate change. "I mean, we're moving forward, we're addressing climate change CO2 under our proposal, our ACE regulation. We're also addressing it under our CAFE standard for automobiles. We're using the tools that Congress gave us to address CO2, climate change and we're moving forward on multiple fronts," he told ABC News, referring to the administration's proposals to replace the Clean Power Plan and change fuel emissions standards for cars and trucks. During his Senate confirmation hearing last month, Wheeler was shamed by Democrats after admitting he had not reviewed his own administration's National Climate Assessment, a 1,500-page analysis of the latest scientific data on climate change. He has also faced criticism for rejecting a consensus view among climate scientists, environmental advocates and the leading United Nations climate agency that global climate change is a looming catastrophe. The climate assessment concludes, "the evidence of human-caused climate change is overwhelming and continues to strengthen, that the impacts of climate change are intensifying across the country, and that climate-related threats to Americans’ physical, social, and economic well-being are rising." "Yes I did read it," Wheeler told ABC News. 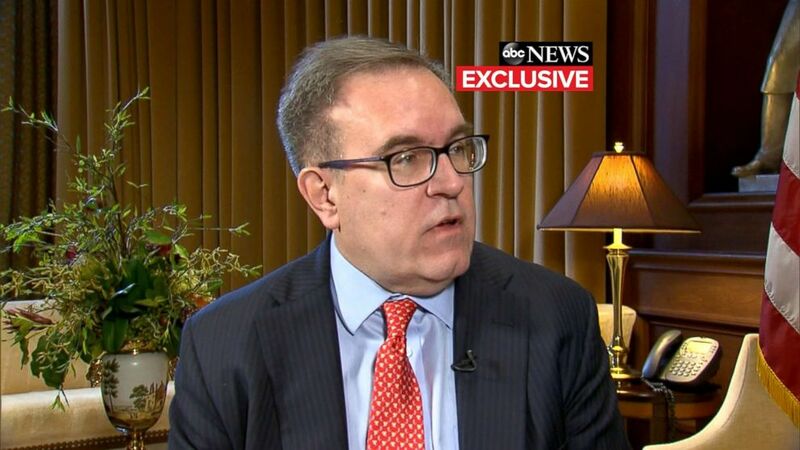 (ABC News) Andrew Wheeler speaks to ABC News in an exclusive interview, Feb. 13, 2019. "But some of the conclusions are based on the worst case scenario," he said. "So, I'm trying to take that report as a whole. I've had briefings by my career staff, the agency which I depend upon, and what's important is that what we're doing on CO2 and climate change is we're following the laws Congress has passed. In our proposal, for example, for the utility sector, once it's fully implemented, we'll reduce CO2 by 33 percent over the life of that regulation." Wheeler said Trump's tweets that seemingly conflate weather and climate are actually being critical of coverage of reports that he said focus on a "worst case scenario." "I think what President Trump in particular is referring to is the media coverage of the climate assessment and the fact the media focused on the worst case scenario and a few other aspects that really weren't in that report," Wheeler said. "But, we are moving forward on CO2 and moving forward on climate change." Wheeler, who began his career at EPA 25 years ago as a young lawyer, worked on drafting environmental regulations under both Presidents George H.W. Bush and Bill Clinton. As an Eagle Scout and self-described "conservationist," he said he wants to chart a different course from his more combative and flashy predecessor, Scott Pruitt, who resigned last year in an ethics scandal. "When President Trump called me and asked me to be the acting administrator, he said continue to clean up the air, continue to clean up the water -- and continue to deregulate in order to create more jobs for the American public," Wheeler said. "He knows we can do all three, I know we can do all three and we have shown that in over the last 49 years of the agency's history."